Power Director 17 Ultra cant play my H.265 videos. I'm sorry to hear that you're having difficulty playing H.265 videos. PD17 is certainly able to import and produce H.265 clips, so the goal is to quickly figure out what's going on with your system. It sounds like there's a missing or misconfigured codec. Can you please refer to the Read Me post at the top of the PD17 forum and post the results of the DxDiag test? That will give us volunteers the details on how your system is configured. Please also post the version number of PD17 as the instructions state. It would also be great if you could upload a sample dashcam clip to GoogleDrive, DropBox, OneDrive (or the like) and post the link here. Once a clip is accessible, we can glean the details and figure out how to get everything working properly on your machine so you can edit your dashcam videos. Quote I'm sorry to hear that you're having difficulty playing H.265 videos. PD17 is certainly able to import and produce H.265 clips, so the goal is to quickly figure out what's going on with your system. It sounds like there's a missing or misconfigured codec. I am having the same issue. Has the problem been figured out? The whole reason I bought the latest version (PD17) was to edit my 4k dashcam videos. The videos play in every single program without issue. But I cannot edit with PD17. Quote I am having the same issue. Has the problem been figured out? The whole reason I bought the latest version (PD17) was to edit my 4k dashcam videos. The videos play in every single program without issue. But I cannot edit with PD17. OP never responded, so nobody knows what his/her/their problem was. You quoted my response when posting, but you didn't include any of the info I spelled out that's needed to figure out what's going on with your computer. I'm afraid we can't help much unless you provide those specifics. Really appreicate you taking the time to look at this. Thanks very much for all the info. The DxDiag shows you have the current driver for your GTX 1070 and nothing else jumps out at me, although your system has had a bunch of program crashes (the most recent 10 are shown at the end of the file), and that implies some possible system issues. You can try using the sfc /scannow and dism /online /cleanup-image /scanhealth tools to see if they can find and repair any issues (Google for more info, if needed). So, the bad news is that your dashcam appears to be using a format that's incompatible with PD's standard codecs. I used VLC to convert it to H.264, and while it's more than 2x the file size, PD is able to play it, so one workaround would be to use a 3rd party converter (like VLC or Handbrake) to convert your clips before editing them. Please download the converted clip from here to test on your system. I know that's not ideal but it's late here and I won't be able to do anything else until the morning. Maybe other forum members will be able to give you some different options and ideas for getting this to work. interestingly enough, the clip is in ColorDirector. Fascinating! 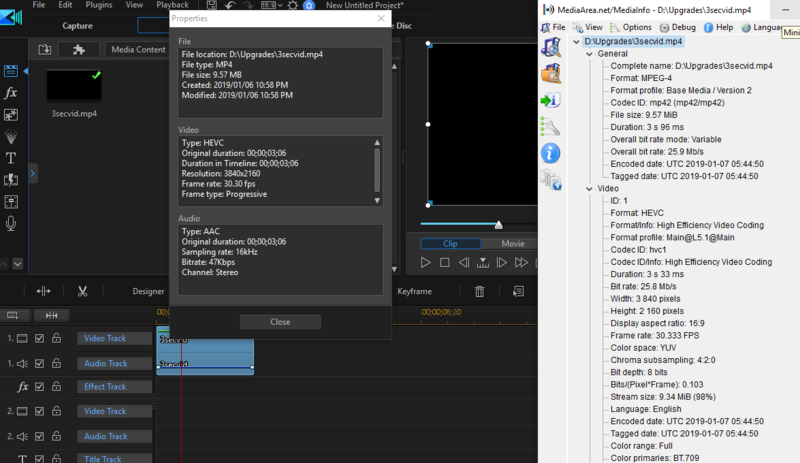 I can also open it in ColorDirector 7 and even in PhotoDirector 10, but AudioDirector 9 reports that the clip is broken. My suggestion would be to report this as a bug to Cyberlink here. Please copy and paste the URL of this thread when you request support, and then paste the CS ticket # back here to close the loop. In the meantime, it looks like converting the clip would be the best way to go unless someone else can figure out why PD doesn't accept it. All of the above confirmed here with sgluke's 3 second video clip. MediaInfo shows nothing outrageous, except maybe 30.33fps (???). Appreciate you guys taking a look at it. I will update my dashcam to use H.264 and hope PDR supports H.265 down the road. The reason we are using H.265 is the wireless speed transfer/viewing is so much quicker from car to car. H.264 is not bad, but thier is a 1/3 noticable diffrence. When transferring hours of footage it adds up. Again, really appreicate your time. Quote Appreciate you guys taking a look at it. I will update my dashcam to use H.264 and hope PDR supports H.265 down the road. The reason we are using H.265 is the wireless speed transfer/viewing is so much quicker from car to car. H.264 is not bad, but thier is a 1/3 noticable diffrence. When transferring hours of footage it adds up. Just to be clear, PD has supported H.265 for years, but there's something about the specific codec that your dashcam uses to encode to H.265 that PD doesn't accept. If car-car transfer speed is the most important issue, you can still record in H.265 and then convert any clips you want to edit later, but maybe using H.264 throughout is faster overall. Kind of confused. I downloaded Movavi and 2 other editors so far. All import and edit the same 4k H.265 video from the dashcam. Hopefully the next version of PDR will be more versatile becuase I really like the layout. Not to sure what to do at this point but hope there will be a patch in the near future. I sent tech support the same info I included here and the response was so far in left field even I knew they were clueless. Not trying to be demeaning, but it was obvious you guys care a whole lot more then they do. Thanks again for your time and take care. Quote Kind of confused. I downloaded Movavi and 2 other editors so far. All import and edit the same 4k H.265 video from the dashcam. You aren't doing anything wrong, and PD17 should be able to work with your dashcam clips encoded in either H.264 or H.265. PD is part of a 4 app editing suite, and two of the other apps can open your dashcam clip properly, while PD and 1 other app can't, so it seems like there's a glitch in PD and the other app. I imagine that PD will get a patch that will allow it to read your H.265 clips, but I can't tell you how long that might take. The simplest way to deal with this while you're waiting is to set your dashcam to record using H.264 and then everything should work. Once the PD patch comes out, you can switch to H.265 again. We passed on this thread and ticket directly to CyberLink yesterday, and recevied info that their RD has it (the video) and are fixing the issue. It should be available in a beta patch soon and the next patch update release. Please note that you may need to rename the video file if you imported it previously for it to work. This is if PowerDirector's media cache is not cleared when reopening PowerDirector.